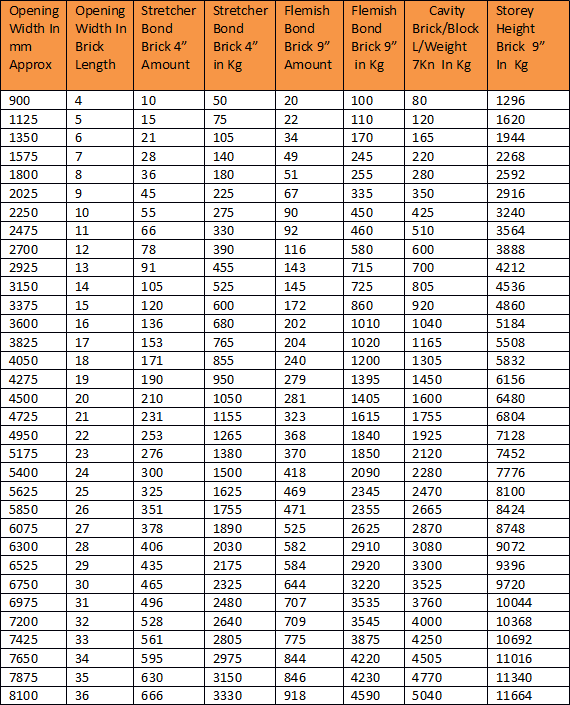 1st Column: Width of opening in mm. 2nd: Width of opening in brick lengths. 3rd: Number of bricks in a full triangle of masonry above an opening of 102mm brickwork Stretcher bond when a load-point is intact. 4th: Total weight in Kg of brickwork above an opening in a full triangle of masonry within 102mm brickwork Stretcher bond. 5th: Number of bricks in a full triangle of masonry above an opening of 215mm Flemish bond when a load-point is intact. 6th: Total weight of a full triangle of masonry above an opening within 215mm Flemish bond. 7th: Total weight of a full triangle above an opening within a cavity wall, Brickwork and lightweight block work. 8th: Total weight of 215mm brickwork above an opening in a typical 2.4m Storey height in any brickwork bond, half the weight for 102mm brickwork; add 50% for 13” brickwork. 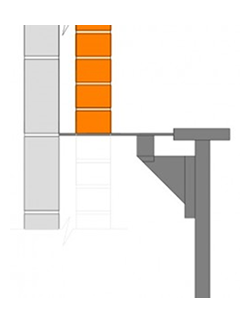 The Brick Brace weight chart is designed for weight awareness to show the difference of the weight of masonry without a load-point and when a load point is intact. 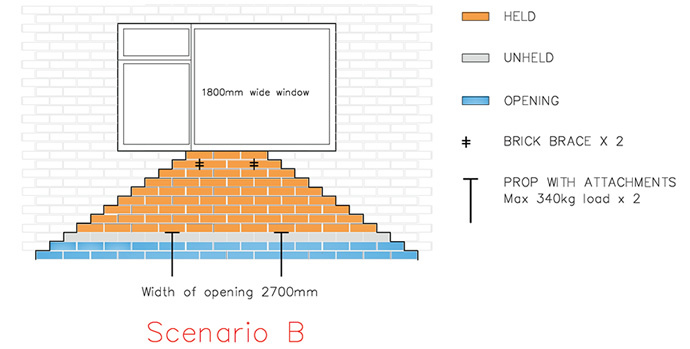 No roof loads are included and a factor of safety of 215mm is included for the different possible positions of a new opening within an existing brickwork bond. 5Kg per brick (F.O.S 1.8) has also been added to allow for the different variety of bricks and the variations of mortar and moisture content. All lengths over 3,150mm are for propping and bracing. When a load point does not exist every task is different and should be calculated on its own merit. If the size and weight of windows are known the weight of the windows can be added and the volume of brickwork that the windows take up can be removed from the calculation. A 35 degree angle in a stretcher bond and a 25 degree angle in a Flemish bond from both ends of the opening, carrying up to the central perpendicular joint where both angles meet is the load-point. All tasks of supporting masonry are different and should be calculated and planned carefully upon their own merit when using a variety of temporary support equipment most suitable for the specific task. When an opening is made within an existing wall and a load point is intact the triangle of brickwork above the opening is the only masonry that could collapse and therefore is the only masonry that requires temporary support. Upon larger openings where any of the 3 points of the triangle do not remain, this law changes and the weight of the whole storey height sits back over the length of the opening due to the masonry above not having the correct arching effect, this can weigh up to 10 times more than the smaller triangle of masonry. Fit the Brick Brace Safety tool through the broken triangle and it becomes complete, reducing the load to a minimum and safely reducing the number of props required, cost effective without compromising safety. An overloaded prop attachment relies solely on the lateral strength of the masonry of which is always different especially within lime mortars and is why the Brick Brace should be used when possible. The Brick Brace Safety tool increases the variable safe working loads of all the existing propping methods and addresses all the main causes of minor and major collapse during masonry alterations. We can answer any question regarding temporary masonry support! TWENTY ONE QUESTIONS THE H.S.E, ISTRUCTE, THE TWF & THE H.A.E REFUSE TO ANSWER! 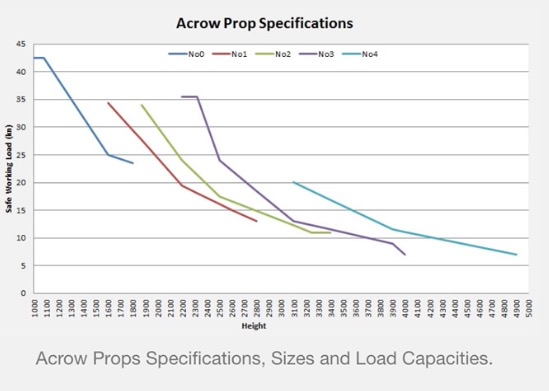 Can you confirm that a Strongboy and all similar designed products have been fully tested upon a size 1 Acrow prop, a size 2 Acrow prop and a size 3 Acrow prop? And as a Strongboy is designed for use with an Acrow prop can you confirm Acrow prop guidance is not required within the instructions of using a Strongboy especially when Strongboy’s are mostly sold with size one Acrow props through mail order due to the lower weight? 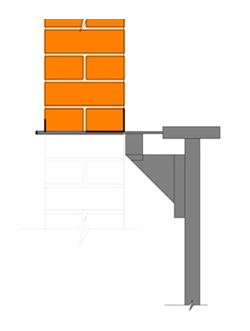 2: Can you confirm that the drawing below is the correct way to support a cavity wall using a Strongboy? 3: Can you confirm it is acceptable to support 9” brickwork or block work on the 215mm tongue of a Strongboy at a minimum 300mm eccentricity from the centre of the wall to the centre of the Acrow prop and when the safe working load is reduced to an unknown quantity? 4: Can you confirm that the H.S.E have not endorsed the Strongboy by allowing misleading and insufficient guidance for over twenty five years. 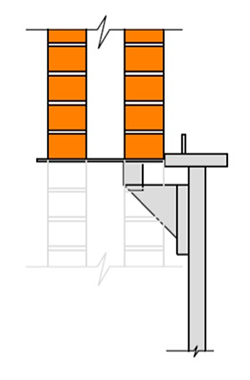 5: Can you confirm it is acceptable to support one side of a cavity wall on the bendable part of the tongue when the internal skin of block work impedes correct use, reducing the safe working load to an unknown level and when safer options are available? 6: Can you confirm that you know the many tasks of supporting masonry are totally different and that the majority of tasks require far more fitting work space than the low safe working load Strongboy can safely offer when maintaining the maximum 340kg safe working load and when not dangerously removing the opening down to the full finished level without the permanent support being fitted as it increases the risk of accidental removal of loaded Acrow props during the demolition of the masonry? 7: Can you confirm that misusing an Acrow prop by eccentrically propping a masonry wall from only one side at a minimum of 200mm from the centre of the wall to the middle of an Acrow prop is safe when the maximum permitted eccentricity of an Acrow prop is only 25mm? 8: Can you confirm the new instructions of a Strongboy are acceptable and do not require any revision? And can you confirm the market monopoly of the Strongboy and the misleading instructions have not fixed the typical builders and retailer’s mind-set and stopped essential temporary masonry support equipment join the market place? 9: Can you confirm that the same number of accidents and near misses would occur if a written warning was in place at the point of sale, such as; “fitting a Strongboy misuses an Acrow prop and the safe working load is reduced by at least 90%” ? And can you explain why accidents during masonry alterations are classed as falls from height & not accidents from masonry collapse? Is it to cover up and to hide the true scale of the number of accidents caused by Strongboy misuse during masonry alterations? 10: Can you confirm that the Strongboy is safe to use when sold without written guidance especially when the internet is still full of the old out of date instructions from the unaware retailers that do not know the instructions were changed in November 2015? 11: I have yet to see a Strongboy being used correctly on site, can you confirm a Strongboy is not designed to be misused and that no further research upon the Strongboy’s design is required and please confirm the self certification tests of the Strongboy and of the similar designed products comply with the provision and use of work equipment regulations? 12: Can you confirm a Strongboy is designed to reduce masonry damage without being overloaded and is simple and easy to use without compromising the user’s safety? And for a level of true guidance (to raise safety awareness due to it occurring on a daily basis), what would be the reduced accepted working load in 10mm increments when exceeding the maximum 215mm eccentricity and when the safe working load of a plumb Acrow prop is reduced by 1,700kg when loaded 25mm from the centre axis? And due to dangerous misuse and risk of curving the inner tube, what is the safe working load of the Acrow prop when used for its next concentrically loaded task? Could it be dangerously reduced to an unknown level? 13: Can you confirm that structural engineers do not specify or recommend the use of Strongboy’s when they do not provide the correct fitting work space and when the safe working load varies to an unknown level of which depends on the size of the Acrow prop used, the working height of the Acrow prop, how plumb, how tightly fitted and how far the Acrow prop is fitted from the centre of the wall? And who police the structural engineers that have endorsed the Strongboy for over 25 years, is it the H.S.E that take unsound advice from IstructE and the Twf? 14: Can you confirm it is acceptable to change the instructions of a temporary support product and not tell anyone of the changes including the retailer’s, builder’s organisations such as F.M.B and the hire associations? 15: A Strongboy is designed to reduce masonry damage and to reduce the number of Acrow props from the work area even though it reduces the safe working load of an Acrow prop by at least 90%, can you confirm that using a Strongboy is suitable and safe to reduce internal 1st floor wall damage when creating an opening? 16: Can you confirm that the misleading marketing of a product and a brand name that implies strength but physically reduces the safe working load of an Acrow prop by 90% (with no warning) and is sold without guidance and overloaded with the same amount of ease as the manufacturer says it is to use, has not contributed to the number of accidents and near misses. 17: Can you confirm that when an Acrow prop is fitted with a Strongboy and is either overloaded, over tightened or removed away from the wall to gain further fitting work access, the task becomes dangerous as the safe working load is reduced to an unknown quantity? 18: Can you confirm that using a mixed variety of temporary support equipment most suitable for a task is far safer than only using Strongboy’s for every task. 19: Can you confirm that it is in a builder’s best interest for a so called competent retailer to supply Strongboy’s with no written guidance when a variety of temporary support equipment should be used and when the H.S.E are “trying” to change the mind-set of the typical builder. 20: Can you confirm that if Strongboy’s do not require a maximum opening size or a correct procedure then no other temporary support equipment requires it either or should all temporary masonry support equipment have instructions of correct use and correct procedures of the tasks the manufacturers claim they do? 21, Can you confirm that the structural engineers that specify Strongboy’s even when they are not the most suitable temporary masonry support equipment for a task, has not caused the mind-set of the typical smaller builder and retailer? And can you also confirm that structural engineers and the H.S.E have not helped dangerously ease a difficult task by allowing insufficient guidance and misleading instructions of the Strongboy? And who police the H.S.E when they are wrong and at fault? Or are the H.S.E never at fault? “How is it possible for a structural engineer to design a task safely with Strongboy’s when the safe working load varies from 340kg down to 0kg and depends on the size of the Acrow prop used,which pin-hole height is used, how tight the Acrow prop is fitted, how plumb and how far the Acrow prop is fitted away from the centre of the wall”? the time to discuss the situation and the position of the Institution. With that the Panel thanks you for your query. Our response to the above reply! To whom it concerns, When a builder knows eccentrically propping over 215mm from the centre of the propped wall to the central axis of an Acrow prop is extremely dangerous they will use with the correct caution and the further equipment required. from an art form, only dangerous and so nineteen eighties. obvious accident occurs it’s only the builder that’s at fault? The whole idea of a Strongboy was to reduce the number of Acrow props from the work area on smaller openings when suitable, and in itself, is where all the problems of overloading begin. engineer to ensure if he recommends their use for a particular task. extra increase in their workload. in-between props when props and attachments are suitable or when using the correct method of props and needles. 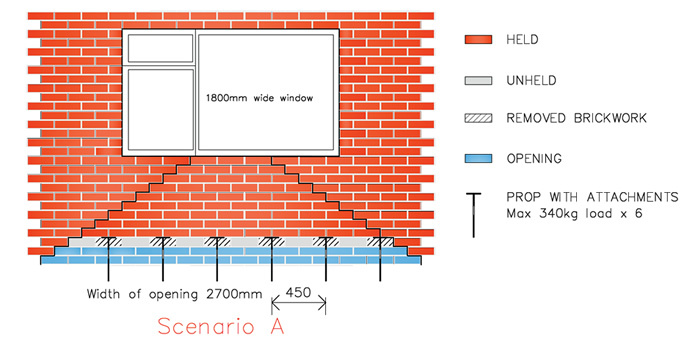 The Brick Brace safety system also supports all 91 bricks within the triangle of brickwork within a stretcher bond above a 3150mm opening (approx 14 brick lengths), at any height with no dangerously overloaded props and attachments required and because we provide full instructions of correct use only competent builders that can read and follow instructions use our system. Please read our E-Bay feedback for proof our system is making a difference to the builders that are capable of adapting and completing a task safely. assistance from structural engineers as they do not supply adequate written guidance when designing the work place. It is in the more than capable hands of both parties to take full responsibility and to address these issues. and I offer my assistance for free to give an unbiased opinion. For the next generation of builder to be taught safely and correctly it is the duty of every structural engineer and tradesman to ensure the temporary support equipment they specify or use provides sufficient fitting work space without overstretching and dangerously overloading itself. We do not endorse the misuse of any temporary support equipment but anyone that continues to overload Strongboy’s through over extending from the wall to gain further fitting space, we highly recommend bracing the masonry with the Brick Brace beforehand to hold all of the masonry in between props and to reduce the risk of minor and major collapse. THE TASK THAT THE HSE FORGOT! © 2018 Brick Brace Ltd - All Rights Reserved.